Learn to remove PDF password from password protected PDF files by using Google Chrome and save unlocked & unprotected file to Computer. Receiving and sending password protected PDF files to one another is a common practice these days. Especially if we receive a PDF file from some credit card company which have some personal information, or exchanging some PDF document officially and to keep its security, it is usually password protected. Since each PDF file is protected by a unique password, so it is almost impossible to remember the password of each PDF password protected file every time before opening, so it is our dare need to remove password protection, so that next time we open this file and there should be no more password. Google Chrome has got this credit to remove password protection from PDF files with its built-in PDF file reader and writer. Open any existing password protected PDF file in Google Chrome and wait for entering the password to prompt. Enter the password that was provided with the file and hit enter to open it. Now go to the File menu in Google Chrome and Choose Print, you can also use short command or CTR+P. Choose the destination printer as “Save as PDF” and hit enter to Save as. Google Chrome will now save the PDF document to your computer without password protection. Open again PDF File in Google Chrome or directly by double-clicking, it will not be asked to enter any password to open and you will get the unprotected PDF file. In this way, you can remove PDF password from password protected document. If you wish to use any third-party software to remove protection or unlocked pdf files, then there is a lot of software available, free and paid. 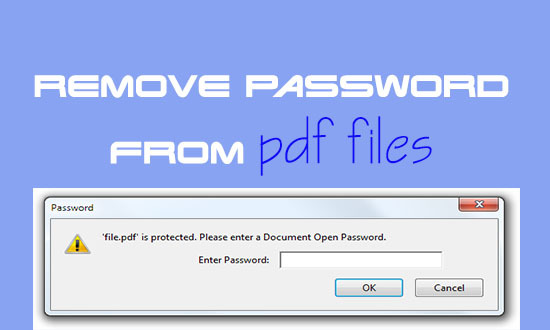 Although this online software removes a password from PDF File, if there is no strong encryption applied, however, one can use them to unlock most of the PDF files, so just search Google to “Remove PDF Password Protection Online” and use any one of them to remove password protection from the PDF File. Hope so you have learned to remove password from Adobe pdf file, do comment if you have any query.